BRUSSELS, Belgium -- You can tell tension has risen to a very serious state of jitters when NATO feels the need for Cold War-style hotlines with Moscow to prevent sudden, armed clashes in eastern Europe. 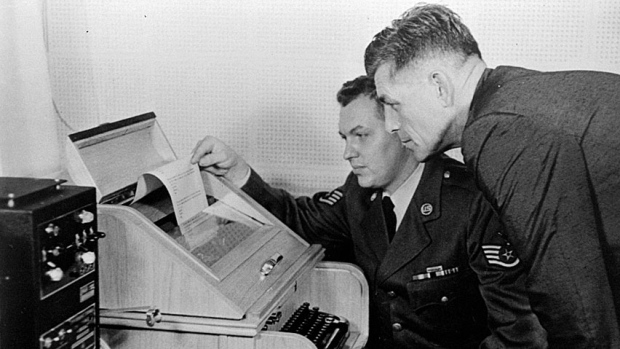 The first Moscow-Washington hotline, which used teletype machines, was introduced after the Cuban Missile Crisis of 1962. This is no routine diplomatic caution. Hotlines are set up when parties fear there is a real possibility one side or the other might inadvertently push a tense crisis into an armed clash capable of triggering actual war. The first one, famously, was set up between Washington and Moscow after the 1962 Cuban Missile Crisis pushed the two superpowers to the brink of thermonuclear war, and was kept in readiness all through the long Cold War. We're not near that level of risk now. But relations between Russia and the Western allies are bad enough to cause official alarm given the increasing security concerns and steady growth of forces — from the Baltic region to the Black Sea, on both sides of the Russian border. Moscow and the West blame each other for the tension, and on April 20 the first meeting in two years between Moscow and NATO to try to ease the standoff over Ukraine ended with neither hint of progress nor any sense there'll be an easing of the current military escalation in central and eastern Europe. That's when talk of hotlines came up. NATO is particularly concerned with a renewal of clashes in eastern Ukraine along with what it sees as large-scale snap Russian military manoeuvres near the border regions of eastern Europe. Those manoeuvres are "clearly destabilizing," a NATO diplomat told Reuters. With both sides engaged in ground exercises, along with naval and air surveillance, NATO Secretary-General Jens Stoltenberg called for hotlines to avoid inadvertent clashes that might plunge the whole region into combat. "We have to use our lines of communications," he insisted after the April 20 meeting, warning that NATO-Russia relations have now descended into "profound disagreements." Stoltenberg may even have understated matters, given that the Russians spoke of a complete breakdown in joint NATO-Russia working arrangements. "All co-operation projects that were important for the security of Russian and the NATO member countries has been discontinued," was the blunt comment of Alexander Grushko, Russia's ambassador to NATO. He gave no indication hotlines would be agreed to by Moscow. The timing of such a break in communications could scarcely be worse. April saw the sharpest escalation in fighting in months between Russia-sponsored separatist rebels and Ukrainian security forces along a 200-kilometre (124-miles) front in eastern Ukraine, according to international observers, who pointed to mounting civilian and military deaths. After a bitter war that cost 9,333 lives and displaced 1.2 million people, a ceasefire in the region has held shakily since Russia, Ukraine and NATO members signed the Minsk peace agreement in February last year. But European observers now warn of growing use of mortars and heavy artillery on both sides, as well as increasing threats against peace monitors. European nations have been mainly concerned of late with threats of terrorism and handling the refugee crisis — and are just coming to terms with the new crisis levels flaring in the east. Last week the most prominent leader, German Chancellor Angela Merkel warned that the ceasefire is no longer stable. The Ukrainian government, meanwhile, has called up another 10,000 soldiers to add to the 250,000 now under arms and appears worried the Russian-backed rebel armies are preparing for a major summer offensive. That view is not only shared but expanded upon by Poland, Ukraine's neighbour, which insists Moscow also has hostile intent against itself as well as other NATO members in the Baltic region. "It's time to talk about it openly," Defense Minister Antoni Macierewicz told Polish media recently. "So far, all Russian behaviour attests to systematic preparation for aggressive action." He later expanded on his warning in an interview with German Deutsche Welle TV by insisting Russia is provoking Poland militarily and trying to alter the whole security architecture of Europe. To respond, Poland has launched a 50 per cent buildup of its own forces while demanding more support from NATO members. It has also formed new military partnerships with Ukraine and Romania as part of an increasing effort to deter Russia. This forging of new regional military ties underscores how worry over Russian President Vladimir Putin's intentions is expanding the range of military buildups. Ukraine has now launched naval exercises with Turkey in the Black Sea, where much of the Russian navy is based. Turkey, which has been involved in a deepening feud with Putin since it shot down a Russian warplane suspected of entering its airspace, also announced an agreement to expand joint arms manufacturing projects with Ukraine, a move expected to rile Moscow further. As it is, Moscow has complained repeatedly of the buildup of foreign forces along its western border, the very region its former Soviet Union controlled from the Baltic to the Black Sea as its natural "zone of influence" during the Cold War. Since Russia's takeover of Crimea two years ago and the ongoing crisis in eastern Ukraine, Russian resentment and Western concern over Putin's real intentions have fed response and counter-response buildups of forces, as well as some dangerous close encounters. In March the U.S. announced deployment to Europe of a new full combat armoured brigade of 4,500 troops with tanks and heavy equipment, meant to bolster eastern defenses. It has also increased naval exercises to support the weak Baltic NATO members Lithuania, Latvia and Estonia. In response, two weeks ago, two Russian fighters buzzed at very low altitude U.S. guided missile destroyer USS Donald Cook 11 times as it conducted drills only 70 kilometres off Russian territory. U.S. Secretary of State John Kerry called the intercepts so aggressive U.S. sailors would have been justified shooting the Russian SU-24s down. Russia shrugged off the complaints and, a few days later, the Americans complained a U.S. reconnaissance plane was also buzzed by a Russian jet, suggesting more incidents may follow. Close interceptions in the air, growing military manoeuvres at sea and exercises on the ground, and renewed clashes in eastern Ukraine as the fighting season approaches all suggest it's well past time for a new hotline to go up. The need for one is bad news. The fact there isn't even agreement in place for so basic a security step looks even worse.